A theme I return to over and over again is how to save money by telling the marine industry to take their nautically perfected product and shove it up a thru hull. Life in Mexico has only made me more convinced that the way to cruise safely, sanely and affordably is to purchase nothing from a chandlery unless you can not possibly find an alternative. Corollary, there is almost nothing on your boat except the sails, radar, and chart plotter that you can not find someplace other than a chandlery. In Mexico, you find that folks are a lot more capable of solving your provisioning and preparation needs than in the United States. This stems primarily from a can do, can build, don't-throw-it-away attitude long since gone in our home country. Usually if you break something in the U.S., it is considerably cheaper to throw the item away and replace it than it is to get it fixed. The opposite is true in Mexico where you can almost always find parts, service, or someone who will build a replacement part from scratch. The one notable exception, by the way, to this general rule of thumb is of course electronics. Electronics are disposable everywhere. So if you want a new trampoline for your catamaran, an extension of your bimini, new sail cover, replacement aluminum pulleys for your dingy davits, or a custom engineered wheel for your crank shaft, wait till you get south of the border. The ready availability of good quality craftsmanship, machinists, seamstresses, and mechanics changes your thinking on a myriad of subjects. 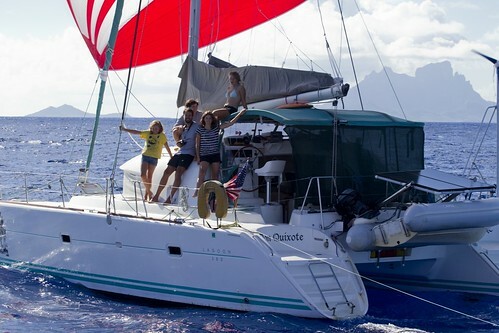 Modifications to your boat that would have otherwise busted the cruising kitty become reasonable investments. Instead of buying something from the States and struggling to have it shipped down, you start looking at ways to fix a part or invest in an alternative. Interestingly, this attitude starts to seep into more prosaic areas of your life. We keep finding ourselves inventing what we call “ten cent solutions to solve ten dollar problems.” The phrase comes from the conversion factor between our old, American-style approach to stuff and our new Mexican version. A recent example is probably one of the best cases in point: the blender. Now going back nearly two years, you might find me noodling on my kitchen tools and utensils trying to figure out just what I would need on the boat and what was totally unnecessary. Ultimately, I decided to get rid of just about everything except a basic set of pots and pans, plates, mugs, and forks. As we cruise, we gradually picked up a key tool here and there as our lives demanded their adoption. Items I could not have lived without in Seattle such as the toaster oven and the whisk never did make a reappearance in my galley. On the other hand, living in Mexico compels the purchase of a hand-held lime juicer – an item I never would have considered essential. The blender was a tossup until we met s/v Beach Access. A blender is big and bulky, it consumes power, and it felt like it had limited utility beyond the occasional frosty drink or batch of pesto. Then Beach Access came along and within a week, Glenn had the girls thoroughly addicted to fresh fruit smoothies for breakfast. It is hard to argue with your children when they exorcise their dogz given right to consume fresh fruit for breakfast. So I started researching the hand crank blender Glenn has aboard. It's nifty, let me tell you. It's also pricey. We found one for $60 in the R.E.I. catalog. It was an item that had to wait till our summer road trip and a birthday. Until we went to Sorianas yesterday and we found a replacement top for a standard, WalMart blender. You can't find these in the States. I know because I once broke ours on the terrazo in the kitchen and could NOT find a replacement anywhere. In Mexico, however, it's challenging to find a new blender, but the blender replacement jugs are on the shelf between the water bottles and the juice pitchers. DrC took one look at the bottom of the blender pitcher and said, “This will work.” Turns out, we have a fitting for our drill which we can use to turn the blender. For 89 pesos (roughly $USD6.00), we could get a blender. 10 to 1. We don't even have to crank it. WHHHrrrrr! If I had it to do all over again – and lordies know living with DrC it's a strong possibility that I'll be prepping another boat someday for a cruise – I'd prepare the boat only well enough to shlep it down the Baja California peninsula and limp into La Paz. I'd fill the bilge with Butterfingers, olive oil, and diced tomatoes, several large bolts of Sunbrella, and roughly 1000 pounds of books. Then I'd spend a few months in La Paz getting the boat ready to cruise. In fact, that's kind of what we'll do this summer. We'll rent a car, drive up to the States, load up on the essentials, and then come back to down our boat where really highly qualified, reasonably price professionals make the boat look and perform like new. I think I'll even hire someone to scrub the bottom... San Francisco price = $125, Zihuatanejo price = $35. Wow, I must have just missed you guys. 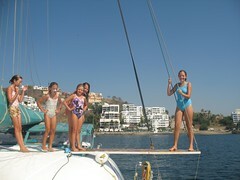 I left the marina in La Cruz on Friday the 13th at 1030 hrs to fly home. I love the SPOT map, but it took me a minute to realize the sat. pic. is pre-marina. Make sure you hit the camaron burgers (the "red chairs" by the circle), Jorje's (sp?) with the tacos on the street, and the obvious, Philo's for music. I emailed my interview story (version 3.1) to Andy. I hope the version I sent you was mostly accurate. Tell the girls that the PV net is way too formal and needs their touch. Fresh fruit smoothies for breakfast? Hello sailors, this is brigitte from the saifest in zihua. 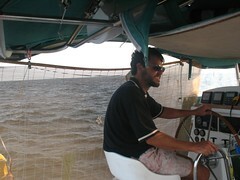 Just to let you know I start sailing lessons in May, hope to see you again in zihua next year.